Artemis BJJ offers affordable Brazilian jiu jitsu from a central location in Bristol, just off the Lawrence Hill roundabout. For full directions, check out the map, which additionally has pictures of the entrance. We also have a session at The Exercise Club on 213 Whiteladies Road in Clifton, every Saturday from 17:30-18:30. Our dedicated, friendly and experienced team of instructors are ready to welcome you onto the mats. We offer classes seven days a week (see our timetable). Lessons are suitable for everybody, whatever your level in BJJ. Your first week is free, to give you a chance to see whether Brazilian jiu jitsu and the team at Artemis BJJ are a good fit for your needs. After your trial, unlimited training is only £40 a month. We are proud to be a member of the United Kingdom Brazilian Jiu Jitsu Association (UKBJJA). We are also part of the international BJJ Globetrotters community, meaning travelers are very welcome to train with us. We also regularly attend BJJ Globetrotter Camps. We pride ourselves at Artemis BJJ on being welcoming to everybody. All are welcome, regardless of gender, sexuality, age or physical ability. We have had the privilege of sharing the mat with a gentleman in his 80s and with amputees. It’s never too late to start: we know a woman in her 60s who is a BJJ black belt. 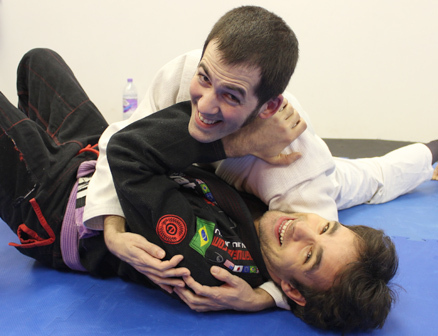 Brazilian jiu jitsu is a versatile martial art which can be adapted to your needs. Your first week at Artemis BJJ is free, so you’ve got nothing to lose. Come and join us on the mats today! If you have any questions, please don’t hesitate to drop us a line at info@artemisbjj.com. You can also call on 07740 197 319, or visit our Facebook page. Also be sure to take a look at our Frequently Asked Questions page, which has further details on things like what to wear, fees and class format. We are on Twitter @artemisbjj, as well as Instagram. If you’re a member of LinkedIn, you can find more Bristol BJJ there too, on our company page. In 2019, we are supporting a local charity, Womankind Bristol Women’s Therapy Centre, on the International Women’s Day weekend, 9th/10th March. Full details here.